Retold from the Victor Hugo original. Set in a richly rendered 15th century Paris, Victor Hugo’s powerful drama focuses on a beautiful gypsy girl named Esmeralda, the two men (including an obsessed and manipulative priest) who love her, and the pitiful hunchback Quasimodo who tries to save her. 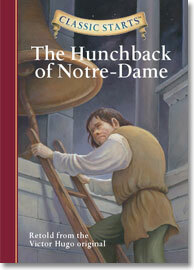 With this simplified yet spellbinding version, kids can enjoy all the excitement of Hugo’s masterful story.